Motorcycle? Check. Helmet? Check. Boots & gloves? Check. Stylish jacket? Check. Attitude? Check. Rides: An orange coloured Harley-Davidson 48. Riding since: Six years. I started with a Bullet 350 during my MBA days to challenge my friend that I can ride a bike even though I hadn’t ridden one before. When I did, I fell in love with it. Next, I started going to college on a pink Bullet. Find me on: The roads of Goa, Coorg through Hampi, Bengaluru, Ooty, Mysore, Gujarat and Mumbai to Pune. Love to ride because: Riding connects me with myself. It gives me my kind of happiness – I feel free! It’s like living in the moment and being connected to myself. Favourite route: The perfect riding experience was from Mysore to Ooty through a National Park. November and December are the best times. Roadside halts: Restaurants and chai vendors across India. In my riding kit: Harley-Davidson riding pants, knee, spine and kidney guard under my riding jacket and riding boots, gloves and two sets of helmets – one full and one half. Riding rules: If I sense a problem on the road, I speed up my Harley and go away at 140 kmph. Worse, the black belt in karate Shotokan SKI comes handy. But I don’t ride at night and never stop at a strange and quiet place. Shuffle chords: Depending on my mood, I change from house to hip hop to Bob Marley to Bollywood. 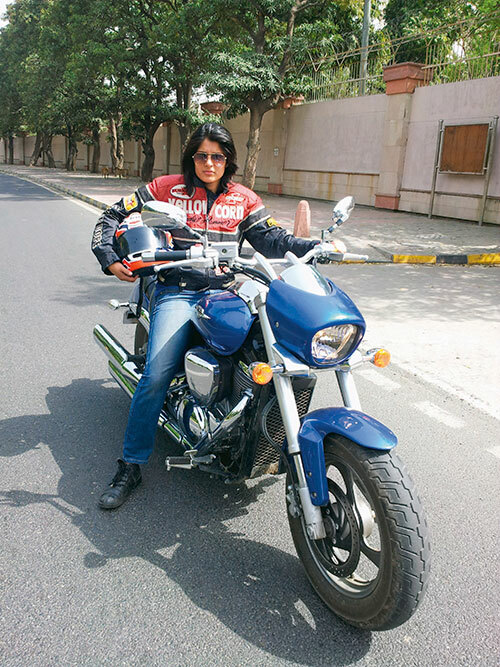 Road tales: With cops, once the helmet comes off and they know I’m a girl, they just check the papers and let me go but Harley does make heads turn, especially if a girl is riding it. I just smile and go back to being in my own world. Riding memoirs: The moment I sit on the bike, the good times begin. It’s difficult to tell which trip was better but I’ll never forget the Coorg one – 3000 km in nine days. From Mumbai to Hampi to Bengaluru to Mysore to Ooty and Coorg and back. There were 10 bikers and I was the only girl in the group. On many days, we were on the bike for 12 to 14 hours at a stretch with no facilities. My needs reduced to just acquiring food, a place to sleep and being happy with whatever I have. It was special! Find her on: A 500 kilometre radius of Delhi. I ride for 200 kilometres on an average per week. Loves to ride because: It’s a real expression of freedom, a great stress buster and fitness tool. Outstation trips are the best way to get to know the country and experience all its flavours. Started riding: Before my feet touched the ground on my father’s Bullet. That first feel of the machine was enough to get me hooked for life. Favourite halts: Dhabas on all routes. The food is great and I can keep an eye on the bike. Haveli on Chandigarh highway or Gushan Dhaba at Murthal are awesome. In my kit: I am a Joe Rocket fan; my jackets, gloves come from them. I like Scorpion for riding pants and all my helmets are Shoei. They are sturdy snug race fits and have great graphics. When travelling, I always carry a puncher kit set apart from a set of levers and basic tools. Riding mantra: Martial arts are not much use on a bike. Bike safety is the same for any rider. Women should avoid unlit roads and engaging with over-enthusiastic drivers. Shuffle chords: I like to keep my wits and senses alive when I ride. Listening to music on a bike especially with speeds upto 250 kmph is a death wish. Road rules: Traffic cops have never been trouble. They stop me but usually just to check out the bike. The strangest looks are however the ones I get on the road. Not only do I get almost every guy on the road raring to race but it’s the fellow travellers who suddenly see the kajal and mascara-lined eyes behind a helmet on a mean bike which is my gallery of Kodak moments. Guys nudge each other, women at times give the thumbs up sign and kids just wave happily. It’s amusing. Riding Tales: Once, while getting back from Jaipur I stopped at a road-side stall to get a cold drink and in seconds my bike was surrounded by men who were interested in knowing mileage, weight and top speed of the bike strangely asking each other, not me, while there was this one old woman who was interested in knowing how my mother allowed me to ride a motorcycle! Someone even asked me if I was preparing for a competition – why else would I be out on a winter Sunday morning at 6 am? The fellow riders I ride with still never let go of a chance to pull my leg about the big hoop earrings under the Shoei helmet or pink socks under the reinforced riding boots. Rides: Harley Davidson XL 1200N Nightster. Riding since: Four years in general, Harley for a year now. Can be seen on: The roads of Delhi or any one that leads to Cochin. Loves to ride because: Riding gives a sense of freedom and power. I’ve been wanting to ride ever since I was a child but had to wait till after college. In my riding kit: Arai helmet, Alpinestar gloves, Woodland shoes, jacket, helmet, gloves and riding boots from Singapore Racing Accessories. Favourite route: The hills. I love travelling to Rishikesh for a quick weekend getaway especially in winters. Best halts: Roadside chai dhabas on the hills. 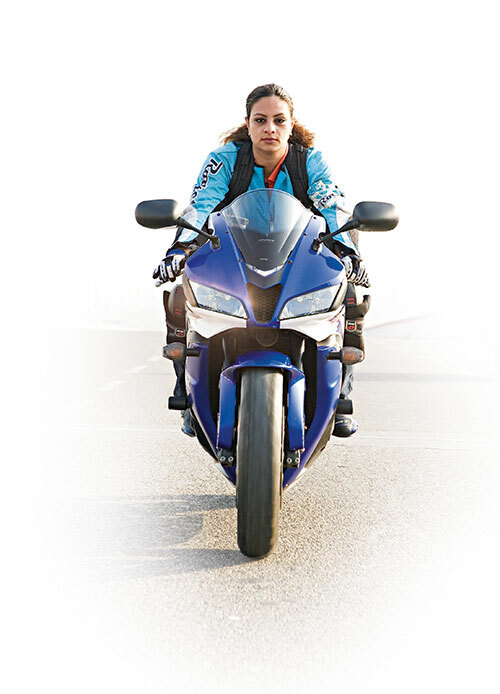 Riding rules: Drive confidently, never think less of yourself as a rider just because you are a woman. Ignore comments and feel proud that you are different! Shuffle chord: Listening to house, trance, hip hop, reggae on my iPod. 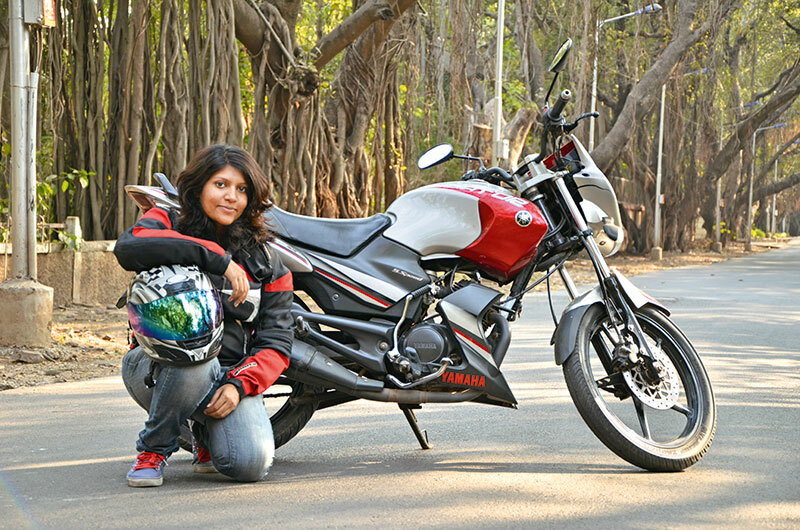 Road tales: Focus on riding and don’t break the rules. Cops don’t trouble you if you have the correct papers. In fact, I’ve mostly got a soft spot with the cops as they admire women riders. Riding memoirs: On my first long ride to Rohtang Pass, my friends and I were just 30 kilometres away from the destination when there was a landslide. All roads were blocked and the vehicles were asked to return to Manali, but we were adamant about reaching Rohtang. We pushed our bikes uphill for about five to six kilometres leaving the traffic and road block behind and then rode rest of the distance on ice. After spending a few hours in Rohtang, our bikes broke down and we had to push them down the same hill again! Somehow, we convinced a mini truck to load the bikes and give us a ride till Manali. It was almost midnight and we were on a truck, standing with our bike with heavy rainfall blocking the view and sending a freezing chill down our bodies. At that moment, all I could think of was when I reach home, I’ll have a brilliant story to tell. Since: 17 (as a learner) and 18 with a license. Can be found on: Pune-Lonavala, Pune-Mahabaleshwar, Pune-Lavasa city/Mulshi Dam for day tours. Favourite route: Srivardhan-Diveagar in Maharashtra is like the Route 36 California. The entire road overlooking the beach on one side makes me feel having lived it up and worth it all. 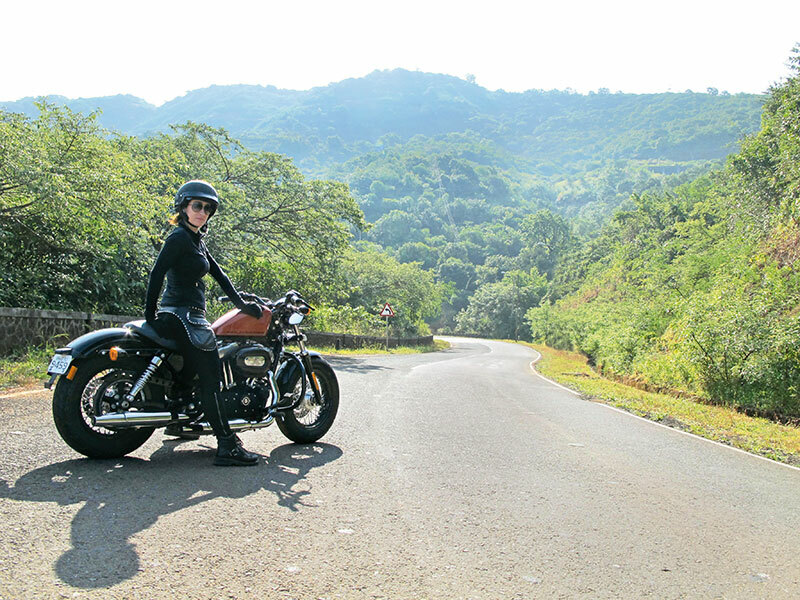 Loves to ride because: Apart from de-stressing, the adrenaline rush is nirvana. It gives a sense of freedom and makes me feel powerful when the bike responds to me…it’s not to show off, it’s for the soul. Riding answered the question I kept asking myself, ‘Who am I?’– ‘I am a biker’. I didn’t realise how it grew on me but I soon became a part of riding groups like The Rubber Smoking Angels. Best halts: Big Wheels Motoring Cafe on the Kanha Phata Talegaon, Mapro Garden, Mahabaleshwar, Lavasa City and Paradise Cafe en route Mulshi. In my kit: A Cross full face helmet, Dream Sporting Gear jacket, Cramster gloves, Fox knee pads, extra clothes, deodorant, make-up, toiletries, lumber belt (an absolute saviour for the lower back), charger, Google maps on my phone, camera, tinted visor, sunblocks, rain gear, bungee cords, chocolates and nutty energy bars, torch, army Swiss knife and Relispray. Riding mantra: For single women travellers, it’s best to find clubs or groups meant for women riders. Keep away from trouble and don’t do things that will seek attention. Be seen around families when at a tourist place. Basic self-defence techniques are good to know for every girl. Shuffle chord: I let the sounds from the ambience like the chirping of birds or a gushing river play as background tunes to my thoughts. Most often than not, I put off my player and enjoy the sounds of nature. Cop tales: I don’t know what traffic is, I don’t let myself get stuck, keep zipping past vehicles and stop as less frequently as possible. It feels really special when people turn their heads to see me. It makes me feel unique. Men look at me in awe, some smile and show appreciation too, some ask questions and try testing my knowledge, some try to chase or race. I discourage that because I believe in road safety. Riding memoirs: The ride to Leh-Ladakh from Delhi is about 1300 kilometers and I covered it in 11 days. It’s the toughest yet most beautiful terrain with barren areas, no network or connectivity for hundreds of kilometres. It’s every biker’s dream to conquer the world’s highest motorable road – Khardung La and this trip was when I did it. It was sheer bliss!